Whether it’s your first time or your twentieth visit to Gran Canaria, watching the SUNSET here on Gran Canaria is always a beautiful moment. You think you have seen it all?! Remember every SUNSET is unique. So, come back again tomorrow for another spectacular SUNSET. Located: Centre of the Gran Canaria, above Tejeda. 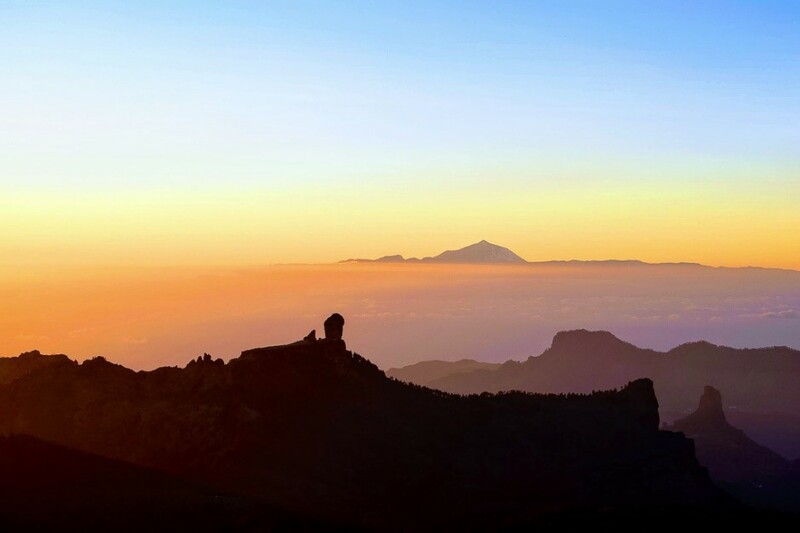 Just take in the fantastic view of Mount Teide in Tenerife – Roque Nublo – Roque Bentayga in one picture. It is a must-see spot!!! The views are spectacular. With 1.949 metres above sea level, the highest point on Gran Canaria is Pico de Las Nieves. It is quite a bit of a drive, about 1,5 hours, but definitely worth the effort. The roads are in good conditions all the way up and down. No words can explain how I feel when I am up there observing this amazing sunset, above the clouds. Go through Telde on GC 100, look for signpost GC130. GC 130 up to Pico de Las Nieves. When you arrive in Ayacata, turn right on to GC 600. You will then come to a T junction turn right follow GC130. Next stop Pico de Las Nieves. Remember warm clothes, go early take a picnic. Located: On the south west coast of Gran Canaria. Drive along the GC1 direction Puerto de Mogan. Continue through the town until you arrive at the Harbour (Free parking in the evening). Now you see some rubbish bins and a dirt path, walk up the path or just follow the crowd. Drive along the GC 500 direction Faro de Maspalomas, some point the road turns into GC 510. Look out for the Parking place. Save you time, just park in there. Parking can be a nightmare otherwise. 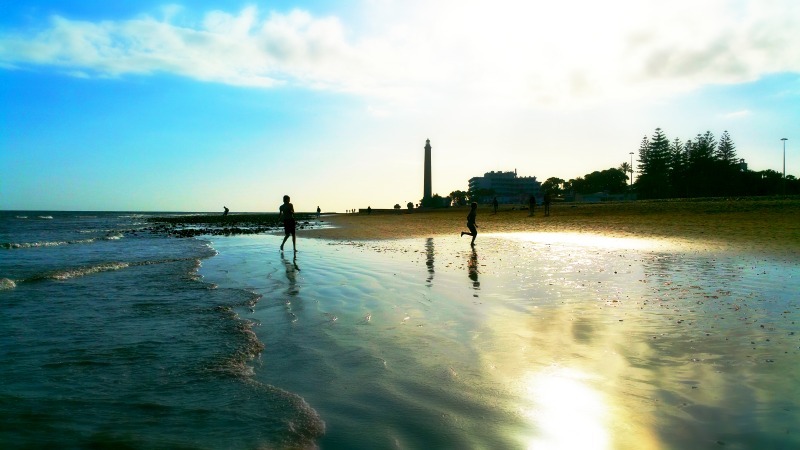 Now 2 minutes’ walk away from Faro de Maspalomas. Anyone knows a great scene for a sunset picture is a silhouette of a lighthouse- fishing boat and some walking people. What if…. you can get all of that in one picture. You can walk along the seafront. Sit at one of the many restaurants – bars just enjoying the view. To the left of the Light house you see the sand dunes, bring a picnic and let the kids are run up and down the dunes. When you are looking at this incredible sunset. 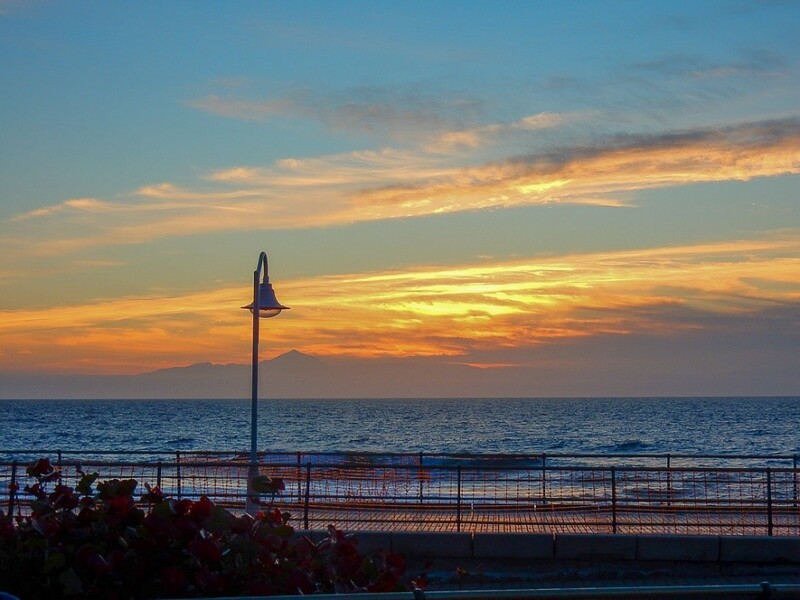 Sorry don´t any sunset pictures from Maspalomas (coming soon). 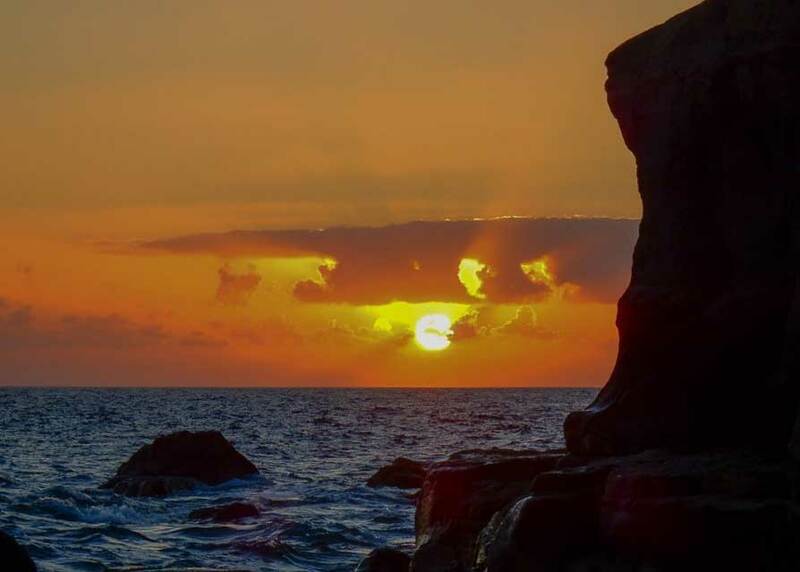 Located: North-west coast of Gran Canaria. Just before Las Palmas- the road splits into two GC3 and GC1. Stay to the left on GC3, direction Galder on the GC2 . Now on the North coast road GC2 – direction Agaete. Signpost for Puerto de Las Nieves will start appearing. Drive through the village down to where the ferry to Tenerife departs. Small fishing village with a panoramic view of the sunset. You can walk along the seafront OR you can bring your swimwear and jump into one of the natural swimming pools- watch the sun and Tenerife (Most days) disappear for the night. Absolutely stunning view. You may have to come back again tomorrow. Located: The capital of Gran Canaria Las Palmas. Parking 3 hours for free. Now you have about 2.8 km of beach front, where you can sit and watch the sunset. You are now spoiled for choices. Where do YOU want to sit and have this beautiful view? Remember sandy beach, surfers, palm trees go hand in hand— When looking for the perfect holiday picture. Sunset and Sunrise Gran Canaria. 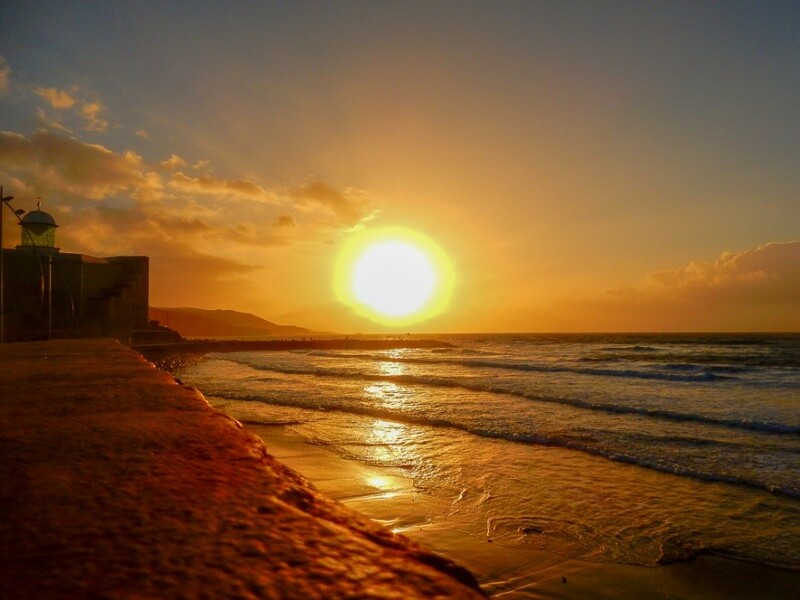 We would love to know what your favourite Gran Canaria Sunset Spots are. Drop us a line or send us some pictures. Hello, I'm AnneMette and originally from Denmark. I moved down to Gran Canaria in 2015 from the cold and rainy but lovely Scotland so I could get a better picture of the sun. I recommend you to try visit this place in Spain located in Canary Island. It is called Gran Canaria and it is a must-visit in Spain. Me and my friends booked a flight to Spain and didnt waste any minutes to visit this island.